CWI plays a central role in various national and international programs and organizations. CWI plays a central role in various national and international programs and organizations. CWI is, for instance, host of the W3C Benelux Office (the regional node of the World Wide Web Consortium in the Benelux) and PWN (the national platform for mathematics in the Netherlands). CWI and Inria have set up an Inria International Lab (IIL) together. The purpose of such Inria International Labs is to fund and develop partnerships and collaborative research with international first-class institutions. For more information about this partnership, see the IIL webpage. CWI is an institute of NWO, the Netherlands Organisation for Scientific Research. 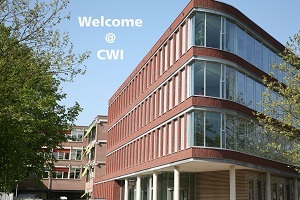 CWI is located at the Amsterdam Science Park, cooperating with the other organizations (such as AMOLF, Nikhef, SURFsara, UvA-FNWI) in research projects, communications and the annual Amsterdam Science Park Open Day in October. CWI has about 200 research partners, such as businesses, governments, financial institutions and research organizations.